Image caption Cocoa the kitten got stuck after crawling under the sofa, fire crews said. Firefighters chopped up a sofa to rescue a kitten after it got its head stuck in the seat. 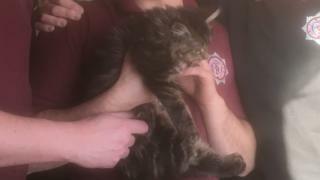 Crews from North Yorkshire Fire and Rescue Service used hacksaws and bolt cutters to free 12-week-old Cocoa, who was "wriggling around in panic". The cat's owner Emma Clark, from Tadcaster, said: "Without them she absolutely would not be here." Station manager Bob Hoskins said: "Cats up trees is a common one, but a cat in a sofa is a first. "It's a very rare occurrence, and fortunately on this occasion it all turned out ok."
The kitten was "making quite a lot of noise" but was not injured, he added.